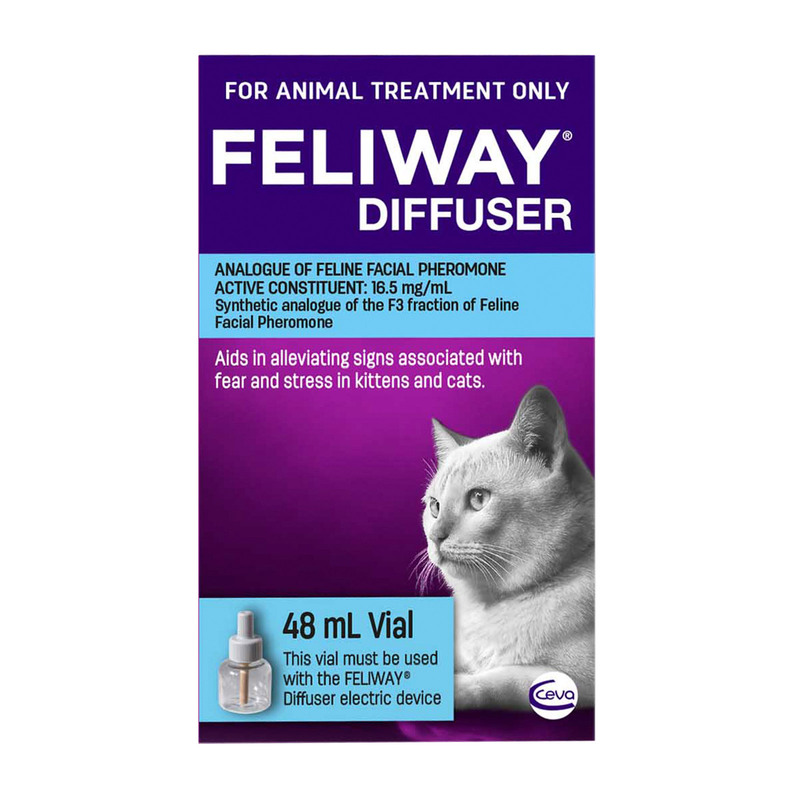 Feliway is a synthetic copy of the feline facial pheromone, used by cats to mark their territory as safe and secure. By imitating the cat’s natural facial pheromones, Feliway creates a state of familiarity and security in the cat’s local environment. It can used to assist in comforting and reassuring the cat while coping with difficult situations. It reduces the stress level of the cat and calms them during travel or hospitalization, when moving to new home or when introducing to a new cat into a multi-cat household. The Diffuser is ideal for multi-cat households, moving home, introducing new pets, redecorating, new furniture, settling into a new home, parties at home, for firework nights. 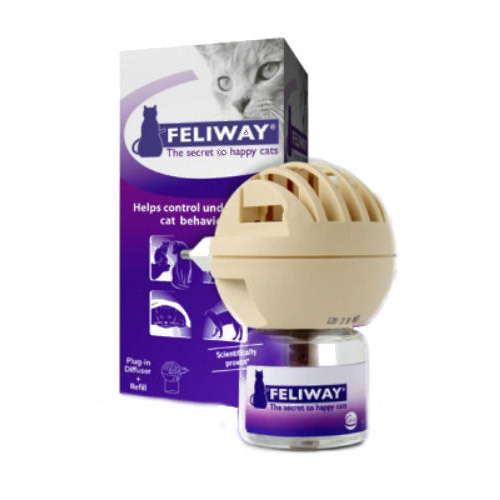 Or use the Feliway diffuser to provide further support to the Feliway spray in scratching and urine spraying/marking. Remove the refill vial cap. Screw the refill vial onto diffuser unit. Plug the diffuser into an electric socket. Leave the diffuser switched on continuously. Diffuser refill should last 4 weeks. Do not plug in behind a door, curtain, behind/underneath furniture, or in the direct line of an air conditioner. Samanta got into some behavioural issues. Couldn't understand what to do. But this spray came quite handy. No more littering and no more scratch marks on the furniture. I bought Feliway Diffuser for my kitty who had the bad reputation of being aggressive. I plugged the diffuser and the results were amazing. She felt relaxed with no apparent signs of aggression. A highly effective product!!! Very comforting for your kitty!!! I bought this product for my two kitties who were suffering from stress induced bladder infections. This stress relieving product has certainly done the trick. Now my cats are more happy without any occurrence of infection. Totally worth it!!! Our 6 and a half year old ragdoll started marking items around the house recently, including the dogs bed...something he hasn't done before..he is desexed..The Vet suggested to try the diffuser and to leave on continuously. It does appear to have made a difference even at this early stage so will probably continue to use it!